Goodbye, Bravermans. Thanks for the memories. Disclaimer: I'm actually not watching the final episode of Parenthood tonight. I really want to, but we're one episode behind and I have to watch the final ones in order. No spoilers please. But I do want to say thank you to the Braverman family. Part of me thinks it's silly to feel like a TV show (c'mon it is a television show) has been there for me. The real-life issues they tackle with raw emotion episode after episode reeled me in. I'm pretty sure I cried in every episode this season. The topics of real life over the six seasons-- cancer, adoption, Asperger's, a sick parent, pregnancy, job loss, marital strife-- are honest. There is no doubt family dynamics can be hard. But the Bravermans express reconciliation to one another over and over again. After watching a season (or maybe less), who doesn't want to be a Braverman? At the least, the Braverman clan has taught us to appreciate our parents. If they're still living, call them and say thank you for raising you. It was hard work. If you can't make that call, know that you are not alone. You're in good company when you shed tears watching an episode and missing your mom (or dad). The Bravermans taught us to forgive our siblings. No matter what your relationship is with your brother or sister, you share a unique bond with them. 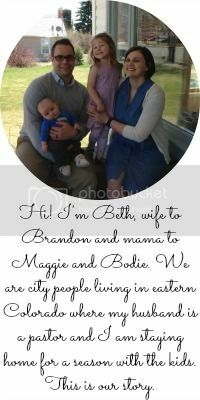 The Bravermans make us consider how we parent and love our kids. They don't tell us how to do it, but they show us how hard it is day after day. The Bravermans taught us so much and I could go on and on. But it's getting late and I want to say thank you, Ron Howard (and the other producers). I'm going to miss the Braverman clan, but I have my own little family and I can't wait to see how where the next forty years (and more) take us! On Saturday morning, I was elated to wake up to snow. I had been waiting all winter (December and January) for a real snowfall. I looked out the window to see the street covered with snow. We usually get snow earlier in the winter and I was so anxious so we could introduce Maggie to snow. I knew she would love it! 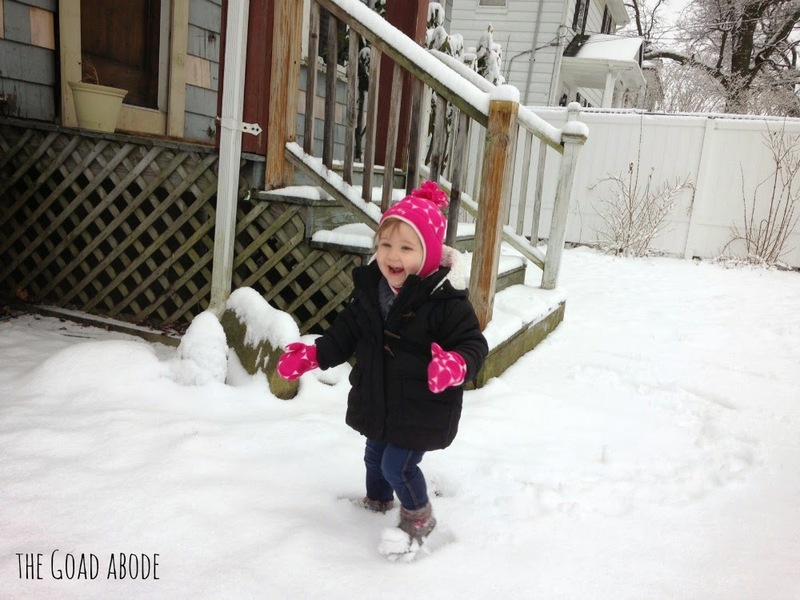 We took her outside Saturday morning and she just giggled with glee as she walked around the front yard a bit. We're now ready for the historic snow storm that started earlier today. Sidenote: how can they call a storm "historic" before it happens? 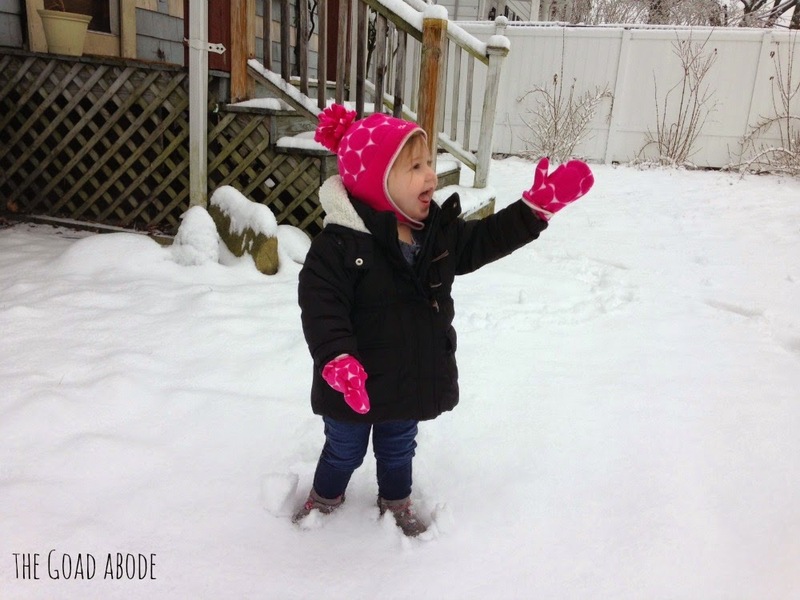 I'm pretty sure Maggie will be amazed at all the snow we wake up to in the morning! Earlier in the month I was kind of against setting goals for the new year. I usually get so annoyed with new year resolutions. Then we started this Whole30 diet a few days into the new year and people were asking me if I planned to not eat legumes, dairy, alcohol or ANY SUGAR for the year. Ha, do you even know me?! (I imagine this being said like Tom Hanks in You've Got Mail "do they even know me at all?!") The answer is no, I am not giving up sugar or even dairy for the whole year. But I am excited about what the changes have shown me in just two weeks (I'll share more on that later). So without further ado, here are the five goals I've set for myself for 2015. Throw more stuff away. I don't mean I want to increase our weekly garbage pickup (I hate the idea of things going to a landfill), so much as I want to be better about getting rid of items (whether trash, recyclable or giveaway) we don't need or use. I'm not a hoarder, but I need to be better about throwing away an item when it breaks or actually get it repaired promptly rather than let it sit around and collect dust. So far there are already some practical ways I have started to attack this goal. With Maggie bringing home artwork from daycare, I created a place to display her most recent artwork in our living room. I've also thrown a few of her things out and I'm making myself be less sentimental about it. When I packed up our Christmas decorations a few weeks ago, I went through everything and purged a good deal. Next year I won't ask myself "why do I still have this?" when I pull out an ornament I bought when I was single and trying to make my tree not so sparse. 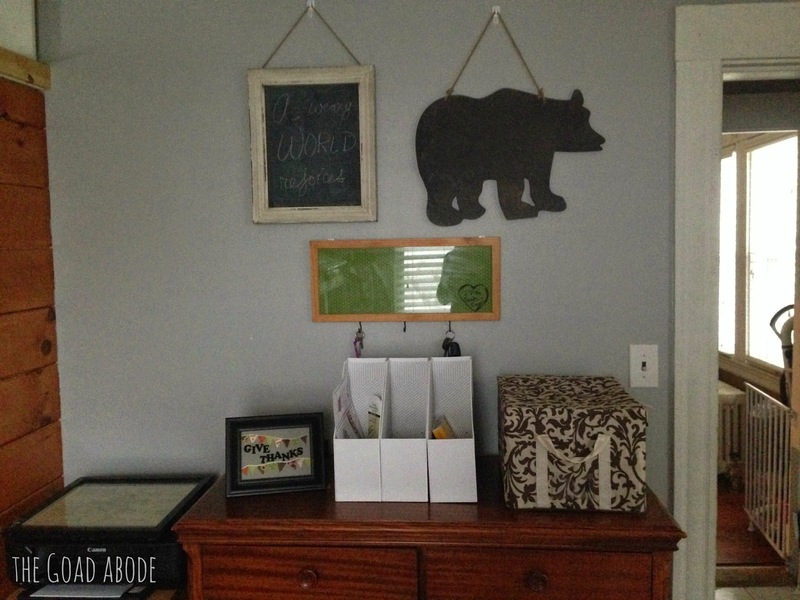 Create and stick to better habits with home organization. This one feels like a seemingly impossible task for me. But we can need to do better with the pile of papers (mail, daycare papers/art, etc.) that accumulates on the counter and makes me want to scream. My action item has already started with setting up the front room (we don't really have a front hallway) with places to hold that annoying paper pile. I have three bins (one for each of us) to sort the paper into and will go through the bins on a bi-weekly or monthly basis. The photo below shows the little organization station and that I finally got a few things hung on the wall in our front room. Simplify my wardrobe. I've been working on this for the past year or so. Having a baby was the perfect excuse to purge and reassess my closet! I'm excited to have some time to sit down and really think about my clothing. My plan for achieving this goal is to use these worksheets I found via Pinterest along with re-reading The No Brainer Wardrobe. I've realized it's not about the quantity of clothes I have (it kinda hurts to admit); the way I feel in clothes is more important to me. Practice mindful eating and drinking. As I'm doing the Whole30 this month, I'm learning more and more about my eating habits. I'm now past the halfway point and starting to think about what foods I'll be eating again. I plan to set limits on those foods I gave up for the 30 days and consider how I'll reintroduce them. As for what I'm drinking, I was never a big soda drinker so my current routine of coffee, tea and lots of water will probably continue. 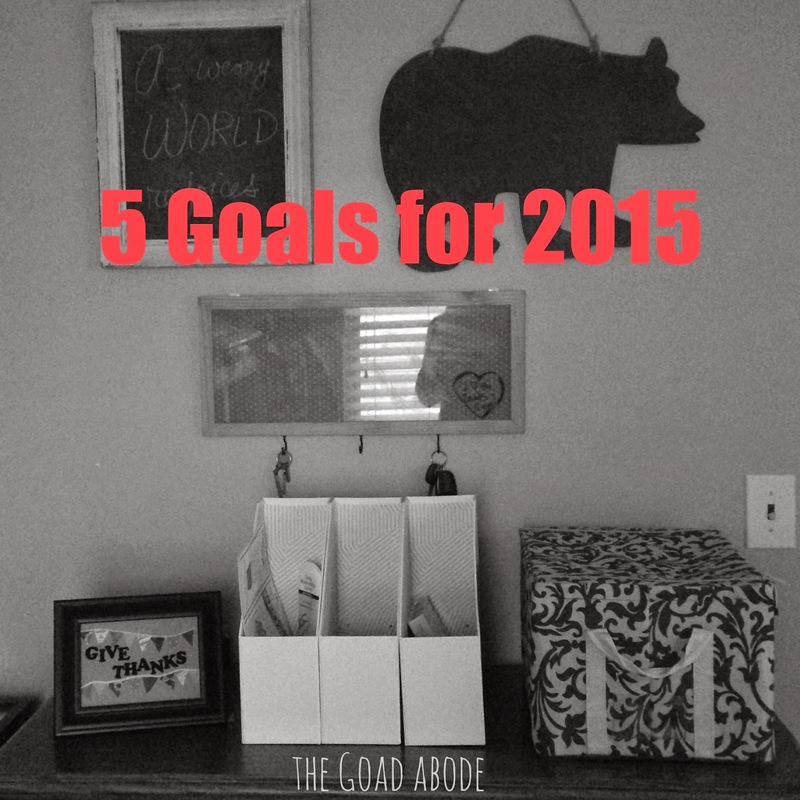 Did you set any goals for the year? 2014 left me exhausted and drained. A mid-year job transition, followed by my husband's job change and Maggie's move to full-time daycare and then more change at work were enough to keep me busy and away from the blog (for the most part). Thankfully, I kept up the monthly Maggie posts, but that was about all I could manage. I really missed writing and connecting with my blog friends. I found myself spending time in different places (online and from my phone instead of the computer). During "downtime" at home, it was/is often easier to hop on Facebook from my phone and get content rather than going to specific blogs. On Facebook I end up reading different blogs like Huffington Post Parents. I've noticed I'm on Instagram a lot more and Twitter a lot less than I was a year ago. I've heard from other bloggers that Instagram has replaced blogging in a lot of ways-- you only need one photo per post instead of 2-3 like I usually try to include in my blog posts. 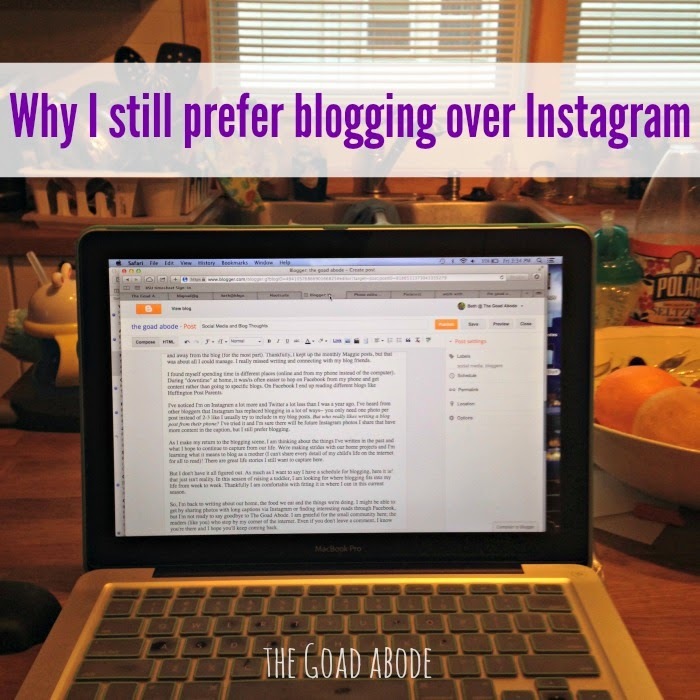 But who really likes writing a blog post from their phone? I've tried it and I'm sure there will be future Instagram photos I share that have more content in the caption, but I still prefer blogging. As I make my return to the blogging scene, I am thinking about the things I've written in the past and what I hope to continue to capture from our life. 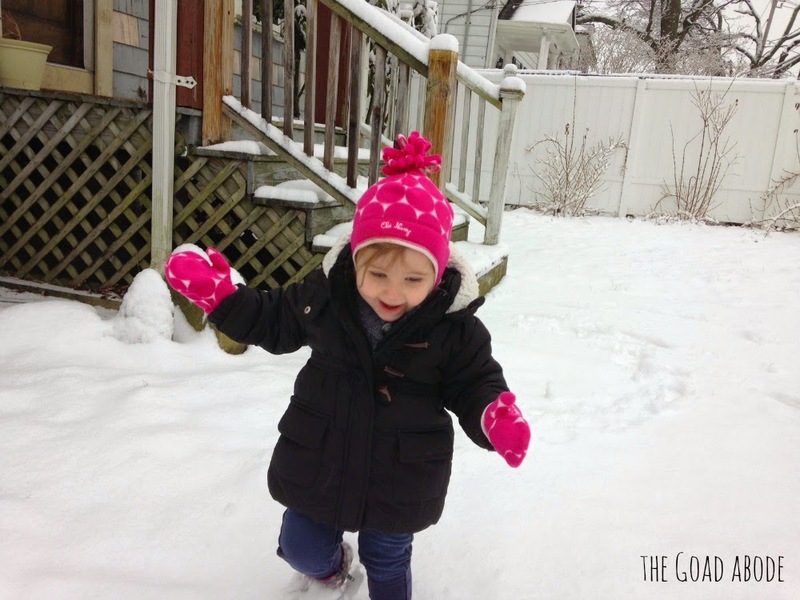 We're making strides with our home projects and I'm learning what it means to blog as a mother (I can't share every detail of my child's life on the internet for all to read)! There are great life stories I still want to capture here. One pretty and a quick sentence or two wouldn't do justice to the stories I can tell through blogging. But I don't have it all figured out. As much as I want to say I have a schedule for blogging, here it is! that just isn't reality. 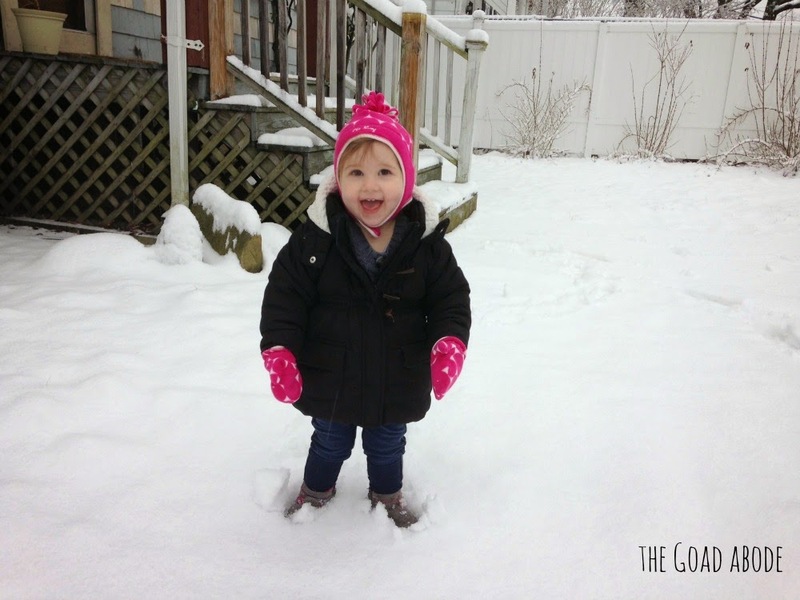 In this season of raising a toddler, I am looking for where blogging fits into my life from week to week. Thankfully I am comfortable with fitting it in where I can in this current season. So, I'm back to writing about our home, the food we eat and the things we're doing. I might be able to get by sharing photos with long captions via Instagram or finding interesting reads through Facebook, but I'm not ready to say goodbye to The Goad Abode. I am grateful for the small community here; the readers (like you) who stop by my corner of the internet. Even if you don't leave a comment, I know you're there and I hope you'll keep coming back. Yes, she's officially one and half years old! 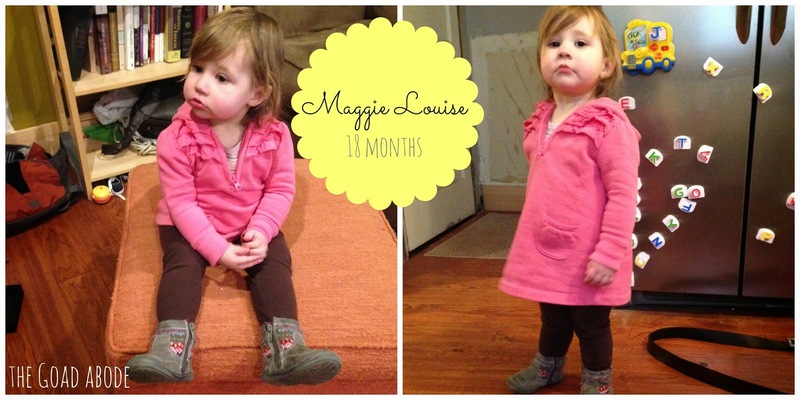 I can hardly believe that she'll be two years old in six months. She has boundless energy and usually jogs instead of walks. We had a little snow on the ground recently and she loved walking in it. We could tell by her giggling as she walked. And I have to comment on this girl's hair! Most days I love it. The color is so pretty and I love the little curls on the backside of her head just after a bath. Most days it looks pretty crazy though. When it gets humid, she totally has President Business hair. I decided not to cut it yet-- she has a major cowlick and bangs would be a mistake (I take full blame as I have the very same cowlick-- she's at least the fourth generation with this lovely mark). Her seemingly wild hair is totally fitting for her energy. It gets in her face and she rarely lets me put anything in it to keep it out of her face. I have to admit I was comforted to read this article. I love the reminder that someday she'll slave over her hair, but for now she doesn't care. 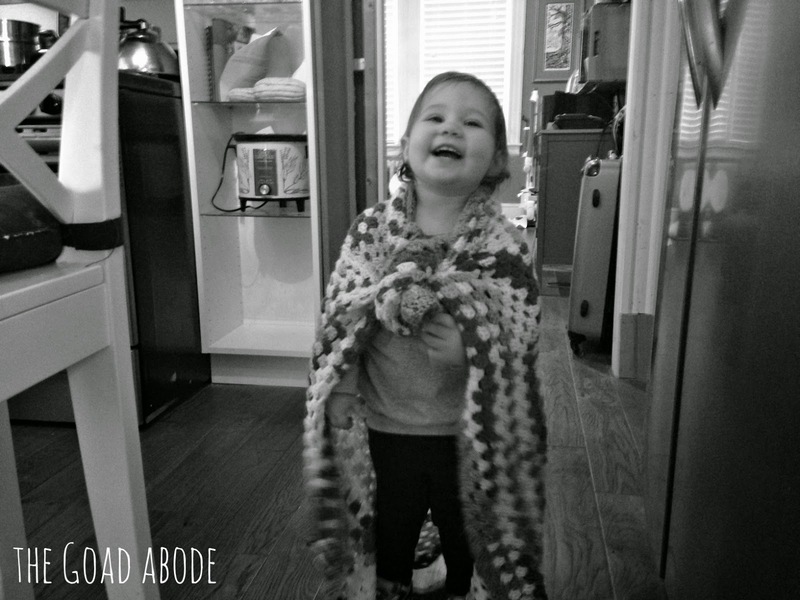 Over the weekend, I tied her blanket around her shoulders for her first "cape." As you can see from the photo below, she was not disappointed! Maggie's vocabulary is growing so quickly. She loves to talk and there are still plenty of "words" we don't understand. Her favorite words lately are "guggie" translated doggie, shoe(s), moo, dada, mommy, "moe" translated more, "boo" translated book, ball and baa. While traveling at Christmas, Maggie started saying "guggie." All of a sudden she developed hawk eyes for dogs and saw them on posters, in books and magazines, in the airport and wherever she went. She loves to read books about dogs. The Pokey Little Puppy is currently her favorite book. Sometimes bears and other animals are mistaken for dogs, but we're working on that. I never noticed how many toilet paper companies use bears in their marketing until she pointed them out as "guggies" last week! December was a long month of one sickness after another in our household. Maggie had two ear infections in three weeks, I had a sinus infection, Brandon had a nasty bug that was also treated with antibiotics and we finished the month with a round of the stomach bug. In the midst of it all, I felt desperate to get healthy and stay healthy! Side note: I'm not one for New Year's resolutions, but this year we are trying a few new-to-us health remedies. I started researching essential oils and learning about the benefits of using them. I had been interested in getting them for months and coincidentally last month I was invited to a weeklong doTERRA class on Facebook. We recently got a starter kit that included 10 oils and the petal diffuser. I'm taking it slow, using the diffuser regularly and I've made my own hand sanitizer using this recipe. This website has been my favorite resource so far. Additionally, we're making some diet changes. If you follow me on Instagram, you already know my husband and I are embarking on the Whole30. I first heard about Whole30 from others I follow on Instagram last year. I started reading up on it, then told my husband about it and he bought the book, It Starts With Food. Before he finished reading the book, he was on board and we were planning meals to begin our Whole30 adventure. We're one week into the program and it's going well. The biggest benefit thus far has been the almost immediate results my husband has seen. He has type 1 diabetes and within the first few days he reduced his daily insulin intake by half! Food prep is definitely more than we usually do day-to-day, but not crazy. We've been making double-batches and freezing half, for quicker meals next week and using the crock pot a good amount. We both feel great and have been surprised by how full we feel after meals. I'm excited to see how the next 3+ weeks go. By cutting back on processed foods and eating real food, I am hopeful 2015 will be a healthier year for all of us!